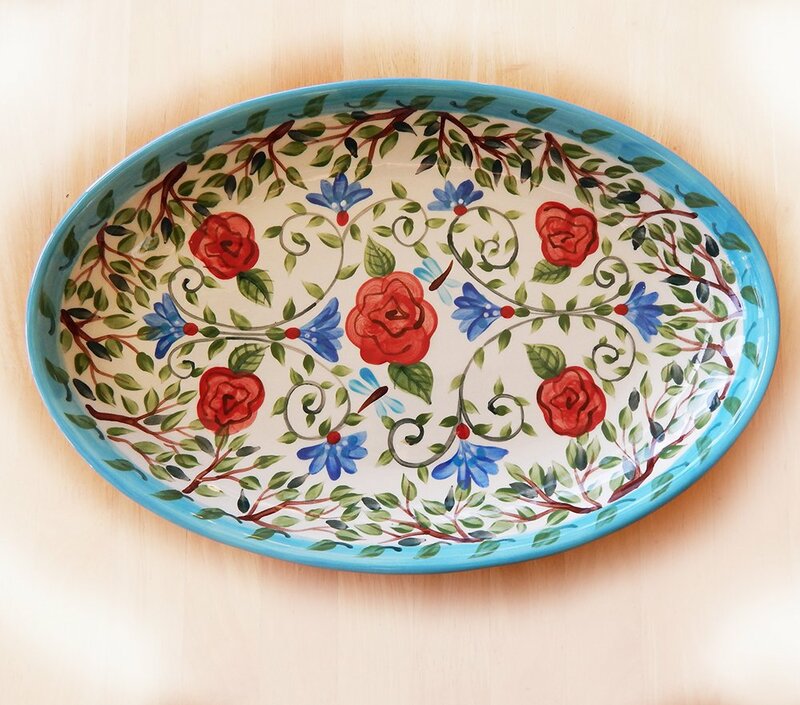 Custom Wedding Ceramic Bowls & Platters are gifts that will not only delight the bride and groom, they will be handed down through the family for generations to come. My hand painted designs reflect wishes for a long happy life together. The designs are intricate and colorful. I paint the Bride and Groom’s name on the bottom with their wedding date. You may also request other personalization, such as for anniversary, retirement, new home or as a recognition reward. Three beautiful designs to choose from give you nice options. I am also happy to do something special with unique colors or design. Long Love is a well tended Garden is our most popular pattern. This phrase is written on the inside of the bowl or back of the 15 inch platter. The colors are jewel tones of aqua, greens, brown and periwinkle blue. A garden of flowers (Bachelor buttons and roses ring the outside) Available in the deep salad bowl, a 15 inch oval platter, wedding goblets or large platter. Wishing you Happy Nest is a favorite choice for new families. 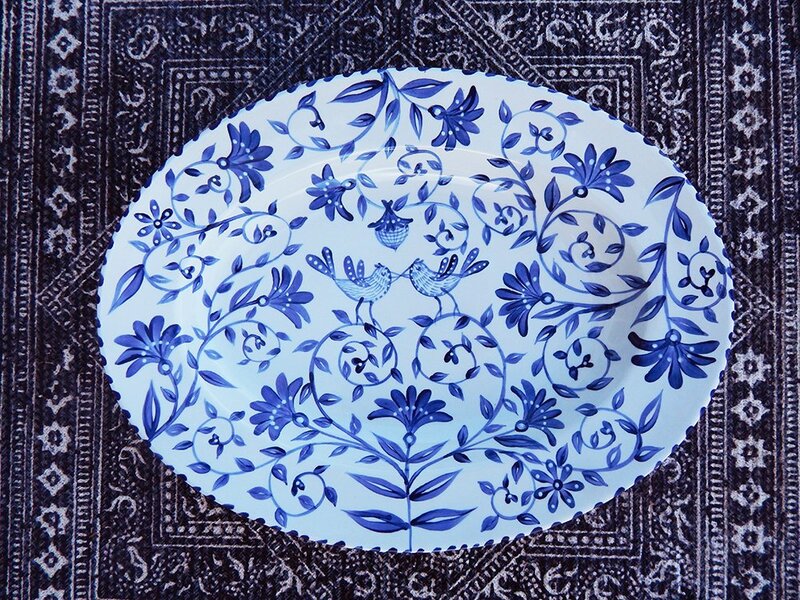 The crisp blue and white pattern is timeless. 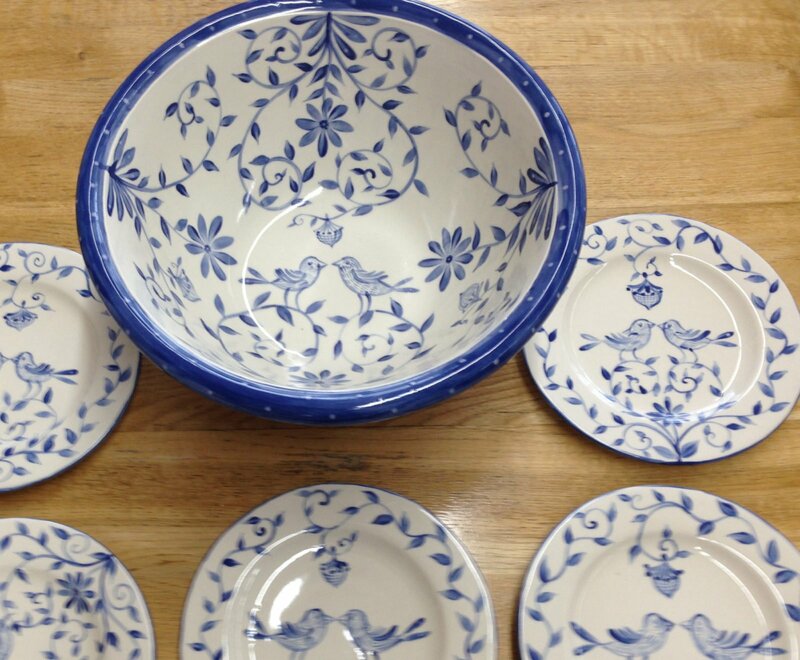 You may order it in the deep salad bowl, a 15 inch oval platter, wedding goblets or large platter. (about 22 inches across by 14 inches wide and 2.5 inches deep.) All our dinnerware is Food safe. 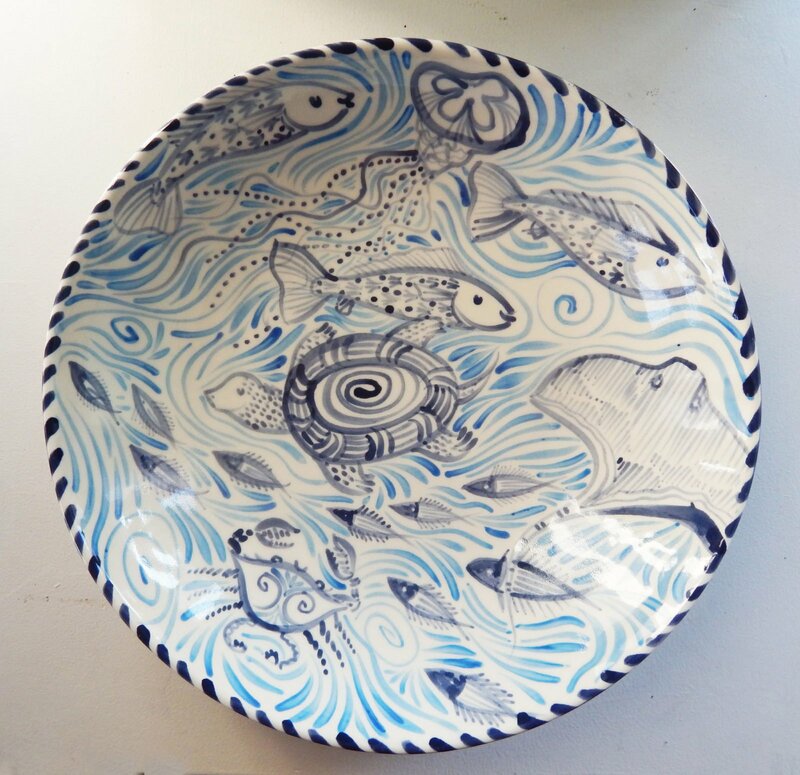 Best Fishes has a seashore theme and is painted in blues. I paint two fish swimming toward each other with a turtle or blue crab in the center. I have featured a Chesapeake Bay theme above. This design is also available in the platters and goblets. Choose a complimentary Gift Card from my designs. There is a Happy Nest card, along with a “bloom together” heart card and other wedding or anniversary appropriate cards. Please allow 2-3 weeks for custom orders. However if you need one sooner, we do try to keep some finished un-customized ones in our store that we can ship that out in a few days.